This recipe demonstrates the Italian cook’s ability to turn cheap, tough beef into something delectable. 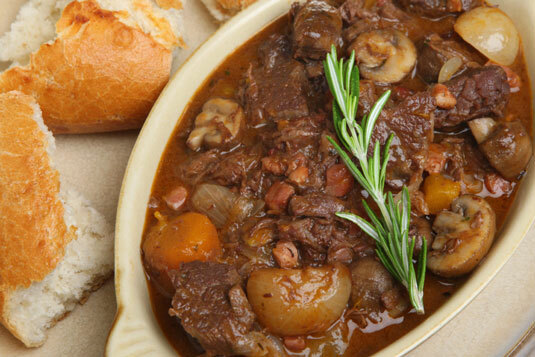 This stew is fairly brothy, so serve it with lots of bread or maybe some mashed potatoes. In a large ovenproof casserole, heat the olive oil. Season the meat with salt and pepper and then add it to the casserole. Brown over medium heat and then add the wine, stirring to dissolve any bits adhering to the bottom and sides of the pan. Let it reduce for 2 to 3 minutes over high heat. Add the vegetables and herbs, reduce the heat, and simmer, covered, for 10 minutes. Add 2-1⁄2 cups water or stock, bring it to a simmer, cover, and then place the casserole in the oven. Add 1 cup water and the tomatoes (if using), season with salt and pepper, and cook for another 2 hours. Add the remaining 1-1⁄2 cups water as necessary to keep the stew moist. The meat is fork tender when done. Adjust the seasoning with salt and pepper, if necessary, and serve.